Since 1955, National AMBUCS, Inc. has awarded scholarships to students pursuing degrees in physical therapy, occupational therapy, speech language pathology and hearing audiology. To date, more than $8.9 million in scholarships have been awarded to over 15,700 students. Learn more or apply for a scholarship here. Don't miss this Q & A-style letter with Executive Director Jay Laurens about bringing Amtryke assembly state-side. Even if you heard the announcement at National Conference in Reno, there will still be some fresh news for you. The AMBUCS National Board, Amtryke Advisory Board and staff are all so excited about this new era in AMBUCS history! The 2019 Amtryke Catalogue is now available. Click for a digital version or reach out to customer service to order. From Edgar's mom to Wish List Donors: I am writing to thank you for the bicycle for my son Edgar Steven. Your donation has fallen to us as a gift from heaven, since he had an operation on his left leg and the bicycle will serve him to have a quick recovery. On behalf of the Cardenas Hernandez family, we are grateful to you and tell you that people like you are like angels sent by god. National AMBUCS has removed the word 'disabilities' from its tagline and mission statement. The move was unanimously approved by the National AMBUCS Board of Directors at National Conference in Reno, NV. Please read this letter from National President Randy Cloud, explaining the decision. One mom said, "Reeve has disabilities, AND he is part of the population that your organization loves and serves. What I like about your new mission statement and what you do, is you make those disabilities disappear. They are gone from your tagline, just as they are gone from Reeve when he rides his tryke." Daniel (11) just received his Amtryke due to the generosity of Wish List donors. His mom said he tries to play it cool generally, but she could tell he was really excited. And that smile says it all! 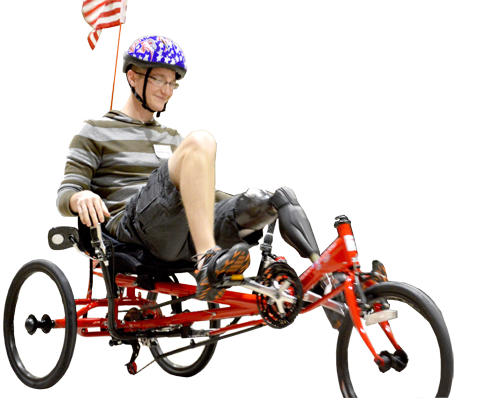 Daniel's therapist said, "This tryke will help keep his legs strong while having a blast with friends and family. Thanks AMBUCS!" We are so excited to announce our Amtryke Evaluation and Fitting Training (AEFT) for Therapists course has been approved by ProCert. Currently, 34 state Physical Therapy Boards accept continuing competency unit (CCU) certification by ProCert. As long as your state is listed and you are a licensed physical therapist, the CCU are certified. Please visit this page for more information about AEFT! The 2018 AMBUCS National Conference was a blast! Read all about what happened. You'll find the images as well as the conference presentations at the links at the top. Ask anyone who was there: it was another one to remember! We hope you'll plan to join us next year in Pittsburgh, PA - October 2-5, 2019. Wait, I’m confused, are you AMBUCS or Amtryke? And those are very strange names, BTW. Yeah, we hear that a lot. When you’ve been around since 1922, you’re bound to pick up lots of ‘character’ along the way. AMBUCS began life as American Business Clubs, a membership organization dedicated to helping people with disabilities. As our model changed to a more standard 501c3 charitable organization, that name no longer described us. So, in 1961, we shortened it to AMBUCS (pronounced AM-BUCKS). It’s weird but so are we, so it fits. 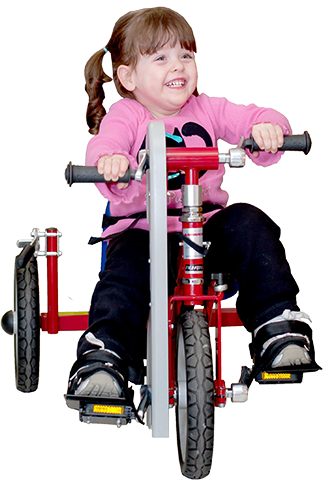 In the mid-1990s we started making and giving away therapeutic tricycles as a national project. Just to keep everyone confused we called both the trykes and the company that makes them, Amtryke. Amtryke, LLC is fully owned by National AMBUCS, Inc.
AMBUCS now has more than 5,000 members in more than 150 chapters in over 30 states. Our members work on a grassroots level to fulfill our mission, Inspiring Mobility & Independence. 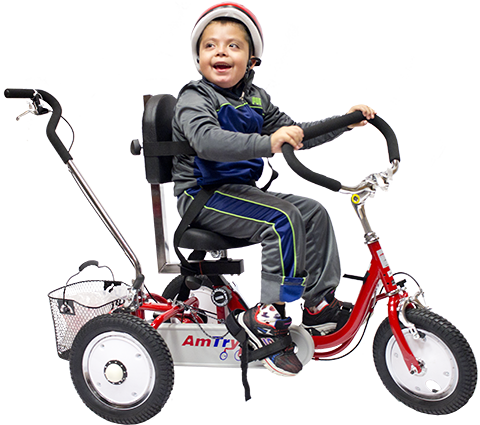 The Amtryke Therapeutic Tricycle Program is one of the main ways we do that. Our members fundraise for and give away about 3,500 Amtrykes each year. Yaakov from Denver is partially paralyzed because of a tumor. The bikes at therapy have been a great source of recovery. Donate to his Amtryke today! Mit is a big American Ninja Warrior fan and wants to be just as much of an athlete. Having a bike will be great exercise. Caroline tries everything with tenacity. She thinks the Amtryke is awesome and can't wait to ride with siblings. Donate to her Amtryke today! The new AM-10 fits both smaller and larger children than the old AM-9! ProSeries 1412 can be ordered with a myriad of options including the rear steering kit. This popular recumbent model steers from under the seat.